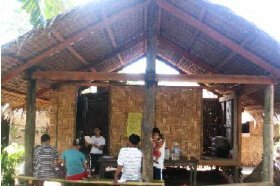 ECPM (Empowered Christians in Partnership and Ministries) is an organisation in the Philippines that seeks to train people in church planting and then sends them out to areas where there are no churches. A team is generally sent to a particular region for two years where they will develop relationships by getting alongside people and helping them with their everyday work, fishing, gathering copra or burning coal, with a view to starting a Bible study with them. Many people in the Philippines have a solid belief in their Catholic faith and many still believe in charms and amulets. Christians are often persecuted by their neighbours and relatives for accepting this new faith that the ECPM team brings. The church planting teams often sacrifice a lot to minister in these places but they are encouraged to continue by the many people being converted and lives being transformed. This partnership seeks to provide financial support for one church planting team. Len and Mary Savill, former New Zealand missionaries in the Philippines, introduced Bright Hope World to the work of ECPM a number of years ago and since then Bright Hope World have financially supported a number of church planting teams in different areas of the Philippines as well as supporting a number of key personnel. This partnership directly supports the team members of one church planting team but indirectly impacts on whole communities as they are shown the love of Christ. ECPM has a strong commitment to training church planting teams and also continuing to pastor and encourage them once they are on the mission field. The teams commit to serve for two years and have been prepared to make a significant sacrifice to bring the gospel to various regions of the Philippines. The church planting team members we support change every two years. To see the current team being supported please look at the latest Report. To develop relationships with local people, getting alongside them, sharing their faith and encouraging them to come to Bible studies.